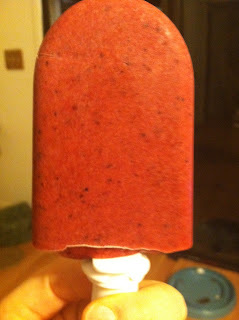 The Bad Kitty Bakery: Berry Cherry Pops with Recipe! I did it! I made my first pops with the Zoku! I was scared and worried that I would mess it up, but I didn’t. The thing that seems to be the key is using all your senses. After nine minutes, my pops were not quite ready, so I waited an extra five minutes, and they were more than ready! Using the removal tool was also odd, until I read the directions and suddenly, it was there! My ice pop! I was so excited. I got the idea to try making one that was healthy and low calorie. I love how these turned out. P.S. You don’t have to add the liquid vitamins, but the ones I have are drops that are sweet and fruity tasting. They do not use any artificial sweetener, so I just placed a few drops in the blender with everything else. It blended right in and I just got an extra little dose of vites! P.P.S. These gave me an awesome bust of energy and made me want a healthy dinner or some weird reason. And another ice pop. That isn’t weird. These are good. Blend all ingredients in the blender until smooth. This will take about 2-3 minutes. Pour into ice pop mold. If using a zoku, this will make 6 pops. Best of all, these are about 40 calories each, with 2 grams of fiber and they have vitamins! Talk about a great way to satisfy your late night cravings. Also, I got most of my ingredients at Trader Joes. The entire batch cost way less than $1.00, so they are tasty and inexpensive!